This past week in San Antonio was an amazing time for the CASE organization! The week started with the CASE Executive Committee meeting for a full day on Tuesday. Do you know your executive committee? President Dr. Mary Lynn Boscardin (MA), President Elect Gary Myrah (WI), Past President Laurie VanderPloeg (MI), Unit Rep Dr. Sheila Bailey (VA), Secretary Julie Bost (NC), Treasurer, Carrie Turner (MO),Journal Editor Dr. Michel Miller (PA), Dr. Pamela Howard(AL) and Michael Remus (AZ), co-chairs of the publication and product review committee, Phyllis Wolfram (MO) Policy and Legislative chair, Membership chair Emilie Maule (IA),Research chair, Dr. Barbara Pazey (TX) and Will Gordillo (FL) are a great leadership team and have the field, students, and you on their mind daily! These volunteers all have full time jobs, and yet they always seem to get it just right! "Success is not final, failure is not fatal. It is the courage to continue that counts!" That discussion was followed by the three members of the Government Accounting Office (GAO) asking questions and receiving comments from the board. Phyllis Wolfram and her legislative committee will be following up with the GAO on what more information they need as they do this study on the paperwork/regulations issues. After the Board meeting, the 25th annual CASE fall conference began with a bang! CASE awarded our first ever "G" award to Tammy Lampereur (WI) a new SPED Administrator who has demonstrated core values and the desire to "stick out her neck" for staff, students, and parents! The award was the vision of Kevin Gersh and he was present to present this first annual award and to present Tammy with $1000 for a special evening out back in her town! We need to encourage the "younger" administrators any way we can! The conference’s first keynote was Dr. Frances Stetson and as always she was right on target! We also heard from Drs. Stevan Kukic and Randy Sprick. One of the most exciting aspects of this great week in San Antonio was the presentation of the CASE affiliate charter to TCASE! The Texas Council of Administrators of Special Education were great partners and hosts for our meetings in San Antonio! Thanks so much to the organization and the leadership! It was so exciting to have TCASE president Cindy Moses receive her charter with CEC Executive Director Alex Graham present! We are thrilled to have added two new affiliates in the last six months to our CASE association — WASEA (WY) and TCASE (Texas). We don't have to wait for Congress, We can make our own recommendations and even try to implement change through our leading by convening! But we can only do this with your help! We want our members to be engaged! 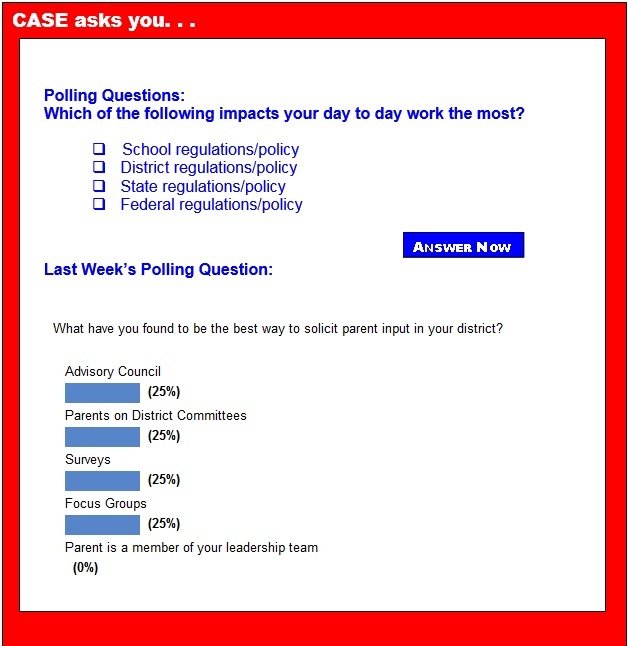 How — complete surveys, make comments, attend CASE PD opportunities and of course be active in your state or provincial unit! Have you learned all you need to know about Results Driven Accountability? I am betting not. The 4th Annual CASE Hybrid conference, Feb. 19-20, 2015 is going to be all about RDA! As it relates to student achievement and as it relates to legal issues and as it relates to partnerships! Click here for the flyer on the conference — remember you have two options: travel to the wonderfully warm Phoenix, Arizona, or be the host site for a virtual conference — same low price — and for just $50 you can have the DVD of the complete conference to use over and over and over! For more information and to register, click here. We just announced an exciting roster of Hour of Code ambassadors who will welcome classrooms to their first Hour of Code during Dec. 8-14. If you sign up your class: 100 lucky classrooms will be selected for live video Q&As with a tech titan or tech-loving celebrity. If you sign up your school: You'll also qualify to win $10,000 worth of technology. One public school in every state will win. The deadline to qualify is Nov. 14, so register now. We can't wait to share them. Let us know if you'll be doing the Hour of Code, we'll email you as soon as this year's activities are ready to try. With 5 weeks to go, give your students a chance to learn foundational 21st-century skills and help the Hour of Code get to 100 million students! Despite its growing popularity, many special education administrators, educators and parents still wonder what online therapy looks like and how well it works. To answer the many frequently asked questions about online therapy, PresenceLearningpublished "HOT Questions, COOL Answers About Online Therapy." The new quick guide addresses questions about online therapy's effectiveness, how it works and the logistics of providing services. For your copy of this resource, click here. Are you a CEC member from a diverse ethnic or multicultural group who is a problem-solving networker, loves a challenge and wants to contribute to the success of your professional organization? If so, please apply to join the Nominations Standing Committee, which ensures that all CEC constituent groups have opportunities to participate in leadership development, creates a greater awareness of CEC leadership opportunities and encourages member involvement in various governance activities within the organization. The Committee also solicits nominations and prepares a slate of candidates every year to fill positions on the Board of Directors. The Committee needs at least 2 members* from a diverse ethnic or multicultural group to submit an Interest Form for the Ethnic and Multicultural Groups** position on the NSC. All candidates are slated for election by the CEC's Representative Assembly. Put your leadership and networking skills to great use by submitting your application by Nov. 13. Contact Sharon Rodriguez (sharonr@cec.sped.org) for more information about the NSC. P.S. If you're not able to commit at this time, please share this with another CEC member from a diverse ethnic or multicultural group who might be interested. Thanks! * With the exception of the Immediate Past President, no member of the Representative Assembly or the Board of Directors, except for the two Board members required to sit on the Nominations Standing Committee, may concurrently be a member of the Nominations Standing Committee. The CEEDAR Center has released two new resources available for download. The Role of State Policy in Preparing Educators to Meet the Learning Needs of Students with Disabilities: This paper summarizes the current state policy context regarding educator standards and how they are prepared, credentialed and supported to serve the learning needs of students with disabilities. The module was developed in collaboration with the New Teacher Center, a national non-profit organization dedicated to improving student learning by accelerating the effectiveness of new teachers and school leaders. The module provides five hours of material, including hands-on activities, which can be adapted and customized to your state or district's context and needs. Hunched over their iPads, the three seventh-graders took turns reading the document displayed on their screens. One, Sam Seifert, followed along, while her special education teacher Jessica Waterstreet did the talking — Seifert has difficulty reading on her own. Seated near the center of the table, Blake Hanna recited the words softy, rushing through them quickly. Jacob Voracek, opposite Seifert, took the text more slowly, pronouncing each word with precision and care. Air pollution might be linked to increasing cases of ADHD in children, a study of New York City women and children found. Exposure to pollution before birth might be the key, researchers from Columbia University's Mailman School of Public Health found, after a look at prenatal levels of polycyclic aromatic hydrocarbons, a component of air pollution, and ADHD symptoms in children later in life. Mothers exposed to high levels of PAH during pregnancy had five times the odds of symptoms that characterize inattentive ADHD in their kids at age 9. The study is the first to examine prenatal PAH exposure and behavior in children over time. Although it shows a potential link between the two factors, it does not demonstrate that air pollution exposure causes ADHD. Four minutes of physical activity can improve behavior in the classroom for primary school students, according to new research by Brendon Gurd. A brief, high-intensity interval exercise, or a "FUNterval," for Grade 2 and Grade 4 students reduced off-task behaviors like fidgeting or inattentiveness in the classroom. "While 20 minutes of daily physical activity is required in Ontario primary schools, there is a need for innovative and accessible ways for teachers to meet this requirement," says Dr. Gurd, lead researcher and professor in the School of Kinesiology and Health Studies. After easily capturing the number of seats they needed take control of the U.S. Senate — and padding their majority in the House of Representatives — congressional Republicans have laid out an aggressive education policy agenda that includes overhauling the long-stalled No Child Left Behind law and the mammoth Higher Education Act. While divided government will remain, as the White House is in Democratic hands at least until President Barack Obama finishes his second term, the new political calculation in Congress will likely spur movement on education bills. States are ramping up student data privacy laws, with lawmakers in the 2014 legislative cycle passing 30 of 120 proposed bills aimed at protecting personal information. The most comprehensive law was passed in California in September. It prohibits educational sites, apps and cloud services from selling or disclosing students' personal information. The data also cannot be used to target advertising to students. Isaac Jackson, 5, walked slowly behind Kendra Sarris, his kindergarten teacher, into the hallway outside Room 19 at Accokeek Academy. The pair then sat at two tiny desks facing a concrete wall. It was testing time. "You're going to listen carefully to the directions and try your best," Sarris told Isaac as he settled into his chair. Then Sarris slowly began reading from the script for the new Kindergarten Readiness Assessment, a comprehensive test that has been expanded in Maryland to include one-on-one interaction and is designed to evaluate students in the areas of language, literacy, math, science, social studies and physical well-being. High school students who took the Smarter Balanced Assessment Consortium field test last spring found it far more difficult than younger students did, especially in mathematics, according to a new report. The report released by the consortium includes some interesting "lessons learned" from the field test of 4 million students. The report is based on responses from 19,000 students and 5,000 teachers and administrators. But it includes responses from only 13 of SBAC's 22 member states, and each state created its own survey, so the collected responses can't be seen as representative of the consortium population. Florida embraced the school accountability movement early and enthusiastically, but that was hard to remember at a parent meeting in a high school auditorium here not long ago. Parents railed at a system that they said was overrun by new tests coming from all levels — district, state and federal. Some wept as they described teenagers who take Xanax to cope with test stress, children who refuse to go to school and teachers who retire rather than promote a culture that seems to value testing over learning. According to two new reports by the Center on Education Policy at George Washington University, district leaders in states belonging to one of the Common Core assessment consortia appear to be hedging their bets on the impact of the consortia-developed assessments. Both reports are based on a survey of a nationally representative sample of school districts in states that had adopted the CCSS in the spring of 2014. The first report focuses on district preparations for the CCSS-aligned assessments being developed by Smarter Balanced and PARCC. The second report examines districts' efforts to obtain CCSS-aligned curriculum materials and provide professional development services for teachers and principals.